Kyadondo East MP Robert Kyagulanyi alias Bobi Wine was today arrested by police at his One Love Beach in Busabala. Police earlier cancelled Bobi Wine’s Easter music shows in Kampala, Kitgum, Gulu, Arua and Lira. Bobi Wine this morning showed up Busabala with plans to hold a press conference as planned in regards to his canceled concerts and upon arrival was arrested and whisked away by a police van back to his home in Magere. Police forcefully opened the car in which the MP was driving, breaking his window and pulled him out. However, singer Nubian Li who was with him in the car was not arrested. Popular music events promoter Andrew Mukasa of Bajjo events and Abbey Musinguzi alias Abtex who are at center of organising Bobi Wine’s Kyarenga extra concerts which were supposed to happen this festive season were also arrested. 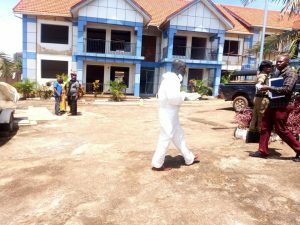 The two were arrested at the first police check- point at One Love Beach-Busabala and briefly detained in a police van before they were whisked away. Upon Reaching Home, Hon. 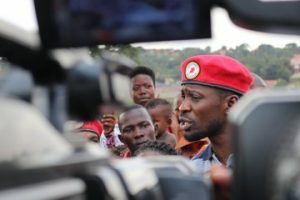 Kyagulanyi held a press conference addressing the media and his supporters that was live on his Facebook page where he told journalists that he now plans to start peaceful demonstrations against the ill treatment by police and other security agencies on the 23rd of April 2019 this coming Tuesday. “After arresting the askari in Apac District in northern Uganda, he confessed and said he had participated in her murder and led us to Muyenga where he had dumped the body in a septic tank,” said Mr Onyango. The area LCI chairperson identified the suspect as Ronald Obonga, a 24-year-old guard. He said the house belongs to Kooki Chiefdom Prime Minister Hajji Ahmed Kiwanuka. 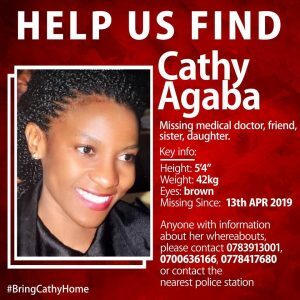 Local authorities said the guard killed Dr Agaba in attempt to protect his job. The doctor had reportedly accused the guard of “not doing a good job”. One of thr suspects is a Uganda doctor based in the US. The doctor who has not been named reportedly worked at Nsambya hospital in Uganda before going to the US. The Gulu Archdiocese bishop John Baptist Odama, has asked government to justify to the nation the purpose and implication of the constitutional amendment on presidential age limit. In his Easter sermon to the congregation at St Joseph’s Cathedral in Gulu town earlier today, the prelate said talks among the population before and after the Supreme Court ruling over age limit amendment has not gone down and could compromise the spirit of love, unity and peace that the country has at the moment. Last week, the Supreme Court ruled that constitutional amendments that scrapped the upper and lower age limitations were rightly done by parliament last year. The judges also concurred that Article 102(b) did not fall under those articles that form the basic stricture doctrine of the constitution which can only be amended by the citizens by way of a referendum. However, Bishop Odama stated that the level of bickering and criticism among the people signals that they are yet to understand what the amendment means. Elsewhere, the need for peace and reconciliation amid challenges in the country has today dominated church messages during Easter prayers across the country. Various religious leaders called for reconciliation, harmony and asked the people across divide to work for peace and development. 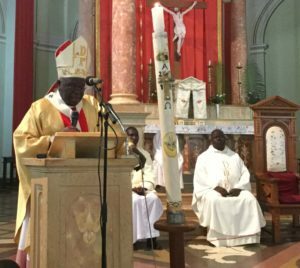 At Rubaga Cathedral, newly appointed Apostolic Nuncio to Uganda, Archbishop Luigi Bianco asked believers to use the resurrection of Christ to promote peace and harmony. Archbishop Bianco emphasized that the significance of the resurrection of Jesus, saying that it brought peace to the world. “What does it mean? It is not commemorating the day of the past. It is to celebrate that Jesus is always with us hence we should let him enter our hearts and minds, but also emulate him to promote peace, unity, love and reconciliation among ourselves,” the prelate said. He added: “If we promote peace, love, kindness and reconciliation, we shall be commemorating the resurrection of Jesus Christ. We should always ask the Holy Spirit to guide us “. Earlier on, Fr Deogratius Kiibi asked Christians to remain hopeful no matter what tribulations they go through. “When Jesus started carrying the cross, he was hopeful that his Father would see Him through all the challenges. We must therefore learn to emulate Jesus Christ by being hopeful even if we are carrying a lot of burdens,” Fr Kiibi said. At St. Paul’s Cathedral, Namirembe, Bishop Wilberforce Kityo Luwalira asked believers to work and seek for peace despite the growing challenges in the country. “There are so many troubles that have robbed us of our peace. At this moment, the message of peace requires people to understand Jesus as the master and giver of peace,” said Bishop Luwalira. He blamed people, wealth, politics, land disputes, domestic violence and greed as major elements that rob peace from people. “There are so many things causing fear. Injustice, child abuse and early marriages, lack of investigation reports in the murder cases, corruption at its highest and witchcraft. But brethren, amid all these challenges, we have to thank God for the word is alive and bringing us peace,” he said amid applause. At the All Saints Cathedral, Nakasero, the Archbishop of the Church of Uganda, Stanley Ntagali called for measures to end the rampant land grabbing gruesome murders in the country. Archbishop Ntagali said that the Resurrection of Jesus brought love and peace in the world but there are situations that are taking away peace from people. “Jesus died that we may enjoy life to its fullness. He gave us peace and life but today, there is no peace in the country because of misery. There is a lot of land grabbing and murders in the country which should stop,” said the Archbishop. The primate added that it is ungodly for Christians to destroy the happiness of a community because of greed which is all due to selfishness. And at Our Lady of Fatima Church in Mubende, the Parish priest, Rev. Fr. Emmanuel Mwerikande warned politicians against use of hate speeches as a mode to lure electorates to vote them in the forthcoming 2021 elections. Fr. Mwerikande said that it is a pity that some politicians are using negative propaganda against their opponents to prove to their point to the electorates. “Let us be kin and desist from such politicians with negative propaganda against their opponents and deny them our votes but focus on those who are explaining to us their good intentions of seeking our votes on the various positions,” he added. Fr Mwerikande also condemned the rampant land evictions in Mubende District which has led to a number of death of innocent people saying there is need for the security agencies and courts of law to work together to bring culprits book. While in Masaka, At Kitovu Cathedral, Apostolic Administrator Bishop John Baptist Kaggwa condemned the increasing family planning use among women saying it is against the bible teachings. “Many Women say they give birth to children they can cater for. Is that what our parents did or they worked tirelessly for us to live?” Bishop Kaggwa wondered. 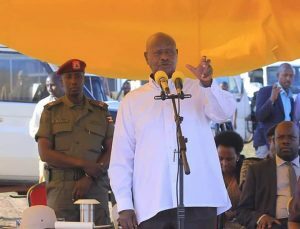 He said that many Ugandans use family planning because they do not want to work hard yet their parents produced many children and catered for them. Bishop also asked leaders who have clocked the age of 75 as per the Constitution to retire in order to bring peace in the country. “The church is doing well in respect to the age limit. If world leaders could also do this, peace would obviously be in many countries,” he added. In Wakiso district, Kyadondo East MP Robert Kyagulanyi alias Bobi Wine asked believers at Our lady gates of Heaven Luteete, to watch out for right things, follow them and reject the bad people with their deeds. Mr Kyagulanyi who donated 40 chairs and Shs1m to the church his constituency also called on the people to live responsibly in the festive seasons. Rev. Fr Charles Ssentongo who led the prayers asked people to join theirs leaders in fighting for justice so that peace can be restored in the country. “We have seen many leaders whom we so much admire and we are asking that you should join them and support them in the fight for justice and peace,” Fr Ssentongo. In Luwero, the Anglican and Catholic bishops of Luweero and Kakasana-Luweero Dioceses have rallied Christians against the persistent corruption that is crippling service delivery. They also castigated the increasing acts of brutality and criminality in society. Bishop Paul Ssemogerere of Kasana-Luwero Diocese said that corruption is not only in public places and government offices but the entire society is now eaten up with every single service now tagged on unsolicited payments before a service is delivered. Luweero Diocese Bishop Elidard Nsubuga decried the rising cases of brutality and criminal acts orchestrated by individuals who take drugs. At Nyamitanga Cathedral, Parish Priest Rev. Fr. John Baptist Tumusiime encouraged Ugandans to keep fighting for better causes in Uganda in order to help people receive services. Fr. Tumusiime said people should not be discouraged on the good causes they have for the country but rather need to be more encouraged in order to make Uganda a better place to live. At St. Mathew Cathedral, Kyamate, the Bishop of South Ankole Nathan Ahimbisibwe asked believers to pray for leaders and the country so that sanity can return in all aspects of life and bring end the increasing criminality. He also asked Christians to desist from anger, condemnation of leaders and judgment but rather concentrate on work and self-development in Christ. The ministry of education will not be able to recruit the planned 22,000 primary teachers in the next financial year 2019/2020 due to a budgetary deficit. While appearing before parliament’s education committee on Friday, Education and Sports minister Janet Museveni said a number of activities that were planned by her ministry remain unfunded in the next financial year. Out of the 18 billion needed to recruit the first phase of 6,000 teachers has not been provided for. She however attributed the delays by her ministry to complete its budget frame work on public universities who have failed to hand in their budgets to be integrated in the whole budget. The education ministry is projected to receive over 3.2 trillion shillings in the next financial year. 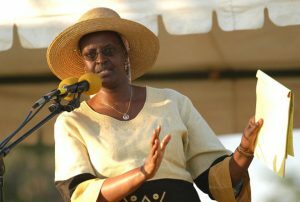 President Yoweri Museveni has appointed ex-Hoima district Woman MP Beatrice Nyakaisiki Byenkya the new Uganda Land Commission boss, replacing Baguma Isoke. Isoke has served at the helm of the Commission, a body charged with managing government (public) land for close to six years. In a letter dated April 8, 2019 addressed to the Speaker of Parliament, Museveni also named new members to the commission, retaining only Charles Muhoozi. No reason is given as to why the old commission was almost entirely dissolved. The new members include former Iganga district chairperson Asuma Kyafu former Gulu university Vice Chancellor Prof Nyeko Pen-Mogi and Ms Stella Achan. The President also appointed former Kabale Town Clerk Mr Rukiika Bujara as a member of the commission. Lawyers have described last evening’s Supreme Court ruling as a betrayal of Ugandans. Last evening, president Yoweri got what some referred to as an arly Easter gift after the Supreme Court upheld the Constitutional Court decision that retained the amendment of the presidential age-limit law. 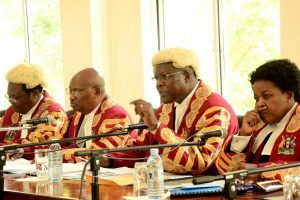 The Chief Justice Bart Katureebe concurred with the 3 justices of the Constitutional Court that the amendments were lawfully made and dismissed the Appeal with orders that each party bears its own costs. On a 4:3 majority judgment, court essentially gave president Museveni a thumbs up to contest for the 2021 general election and beyond if he so wishes. Now the Director-Center for Constitutional Governance Sarah Bireete says the ruling shows betrayal of Uganda’s constitutionalism and rule of law.